Loans have become somewhat an essential running place for Pinoys who are short of money to spend for daily life. Today, the availability of cash credit offers online have become common. They come in many types and upon interviewing my tatay, Sam who is a consultant for a lending company in the republic, I was a bit shocked to be revealed of a data never before seen for online search regarding application. Today, the fast spread of information has greatly affected and improved the lending business return on investment (ROI). On the sides, consultants like my "tatay" already use free websites and free online classifieds to paid sites to promote a related product. See the different Philippines loan list below being offered today for borrowers to take advantage and apply for. To apply or see more details, please click on the green links. Here is a list of the different popular and most availed credit offers in the Philippines today. Have a small business? If it is duly licensed and with accreditation from DTI for single proprietorship and SEC for a corporation and with the right additional required papers, then you can use it to apply for the fast cash for business. There are also those that are short-term secured collateral quick cash option. You won't even have to leave any collateral except probably for a PDC or post-dated check which means that you are going to have to apply for a checking account to a referred bank or preferred bank by the lending company with which you want to borrow money. An agreement must also be signed by the borrower and sometimes by the co-borrower or co-maker for easy approval of your application. On the other hand, for tips in making your application a high chance at getting approved, please visit the green links above. We have posted tips there straight from my tatay who as I've said earlier is a consultant for a lending company based in Makati and have branches all over the Philippines. See list of branches below. 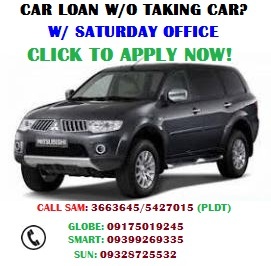 All those branches listed above offer fast cash loan for Filipinos, provided that they could qualify to apply based from certain standards. To see if you qualify to apply, please visit the green links above for the specific type of Philippines loan you are interested to apply for. Visit our Philippines Business page for more ideas.